I will start by giving short notes about the diodes in very simple language. first comes the most basic fundamental component of the electronics world THE P-N JUNCTION DIODE. →It is the simplest electronics device. → The semiconductors are divided into two parts, one is intrinsic and the other is extrinsic where the intrinsic is pure semiconductor and extrinsic is formed when the semiconductor id doped. 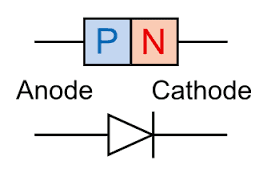 → Now when the intrinsic semiconductor is doped with acceptor in one side and donor on other side that is one becomes p type and the other n type respectively the p-n junction diode is formed. → So basically it is a two terminal device. → It was found in the years around 1940s and 1950s. → The p-n junction diodes are graded simply meaning that they are non-uniformly doped further they can be step graded and linearly graded. → We know that n type has electrons in majority and p type has holes in majority. → Now when p and n type are joined (not literally putting them physically together like a wooden block) a junction is formed. → The electrons from n type flows towards the junction and holes from p type flows towards the junction. → The diode has two conditions- biased and unbiased. → When the p-n junction diode is unbiased or we can say that when 0 voltage is applied the electrons flows to the p side and holes flows to the n side from the junction. → This clearly shows that the holes of p type and electrons of n side are left unutilized so they form an electric field and oppose further diffusion of these carriers. → The region now shows no further movement and is called depletion region or space charge. → When the p-n junction diode is biased, specifically forward bias that is when it is connected with positive terminal of the battery the depletion region ↓ and electrons and holes flow across the junction.When it is reverse biased that is when it is connected with negative terminal of the battery the depletion region ↑ and electrons and holes does not flow across the junction. I am an engineering student, pursuing electrical and electronic. So this blog is basically dedicated to him. Hope I make a contribution in increasing his number of fans !